McElrath, and his sister, Kylie. When it comes to serving the people of God, newly ordained Father Andy Boyd and his mother, Peggy Boyd, have something in common: babies. Peggy Boyd, a nurse midwife with OB/GYN Associates of Erie, has delivered thousands of babies. Last year, after her son was ordained a transitional deacon, he started baptizing some of those little ones. Now that Father Boyd, 26, has been ordained, he likely will christen more children for many years to come. 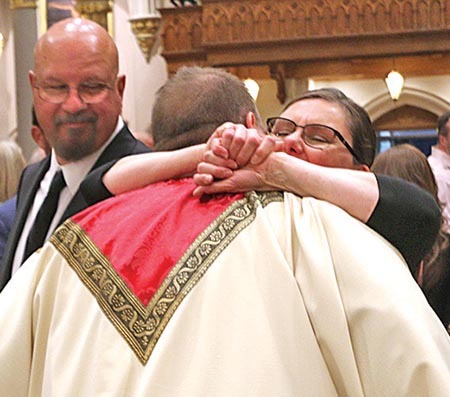 “We’re both doing God’s work in a different way and we’re touching lives both physically and spiritually every moment,” Peggy Boyd said after his ordination Mass June 8 at St. Peter Cathedral in Erie. Boyd's dad, Michael Boyd, looks on. Bishop Lawrence Persico ordained Father Boyd and his classmate, Father Ian McElrath, to the thunderous applause of family members, friends and hundreds of others who attended the ceremony. 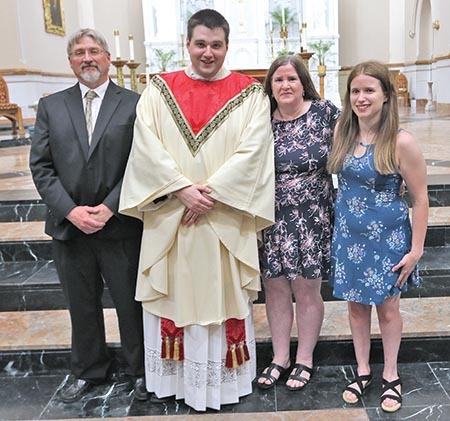 As the new priests were vested with their chasubles and stoles, Peggy Boyd smiled broadly along with her husband, Michael, and Father McElrath’s parents, Robert and Paula. During the ordination, the McElraths both felt the strong presence of Father McElrath’s four grandparents, all of whom are deceased. For the Boyds, their son’s journey to the priesthood seemed to start at a young age. “He was 4 years old when he was running down the hallway to go outside and play. He said, ‘Mom, I’m going out to play rectory. I’m the priest, Mom. I say Mass,’” Peggy Boyd recalled. Father McElrath’s dad wasn’t so sure about his son’s path until later in Father McElrath’s life. “He played music so much that I thought he might go that way, but the two things he really loved were the church and the organ, so it’s worked out pretty well. Now he has both,” Robert McElrath said. Both Father Boyd and Father McElrath point to their parents as their biggest supporters. In May, Father McElrath graduated from St. Mary’s Seminary and University in Baltimore; Father Boyd graduated from Saint Vincent Seminary in Latrobe. Both said their first Masses at their home parishes: Father Boyd at St. James Parish in Erie, and Father McElrath at St. Joseph in Sharon. They are awaiting their first assignments. Both priests view communication as essential to nurturing the faith, especially with declining numbers of young adults regularly attending Mass. Father Boyd takes seriously his role as a communicator.